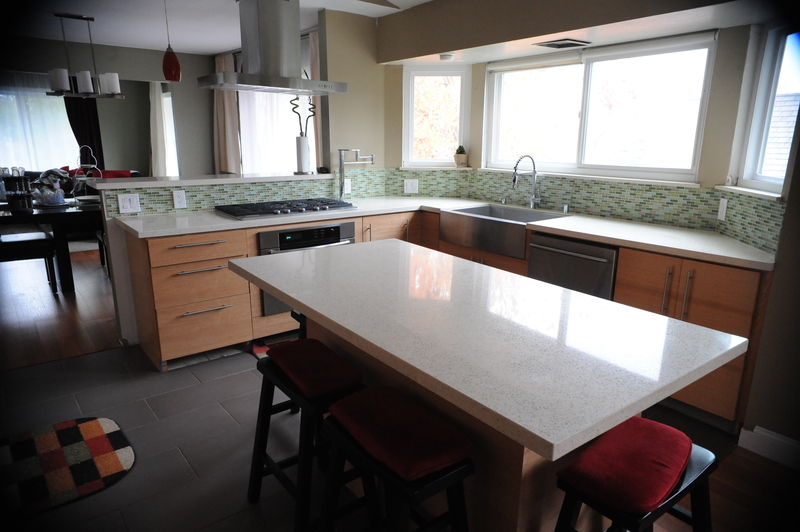 Quartz counters are modern and clean-looking. At Artistic Stone, we carry 5 lines of quartz, Artistic Stone’s line, Caesarstone, Silestone, Cambria, and Pental Quartz. All lines have similar properties. The difference is Caesarstone, Silestone, Cambria, and Pental Quartz offer a 10 or 15 year limited lifetime warranty and ours is a 2 year warranty. The colors are similar but uniquely different. The Artistic Stone quartz comes all come with a 1.5 inch miter edge making it virtually seamless. Our quartz has been test for chemical resistance, hardness, bacteria and mold growth, ignition test, stain resistance and absorption by SDS U.S. Testing Company. Caesarstone has the Good Housekeeping Seal, NSF rating, ISO 14001, and SCS Certified. This is related to the quality For more information about USGC and LEED information, click here http://www.caesarstoneus.com/about/environment-first/.